^ 2014 FIFA World Cup Brazil: List of Players (PDF). FIFA. 11 June 2014: 16 [11 June 2014]. ^ 3.0 3.1 3.2 3.3 3.4 Kramer rising to the top. ESPNFC. 2014-05-31 [2014-05-31]. ^ （英文） Fortuna Düsseldorf vs. Bochum 2 - 0. Soccerway. 2011-07-18 [2014-06-01]. ^ （英文） Greuther Fürth vs. Bochum 6 - 2. Soccerway. 2012-02-25 [2014-06-01]. ^ 6.0 6.1 （英文） Making the Leap to the Top Flight. Bundesliga. 2013-07-07 [2014-05-31]. （原始內容存檔於2014-05-31）. 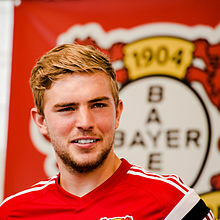 ^ （德文） Christoph Kramer. FussballDaten. [2014-06-01]. ^ （英文） Borussia Mönchengladbach: How will the Foals fare in 2013/2014?. The Boot Room. 2013-07-22 [2014-05-31]. ^ （英文） Bright start for Guardiola. ESPNFC. 2013-08-09 [2014-05-31]. （原始內容存檔於2014-06-01）. ^ （英文） Gladbach Cruise Past Hannover. Bundesliga. 2013-08-17 [2014-05-31]. （原始內容存檔於2014-06-01）. ^ （英文） Gladbach Beat Mainz to Seal Europa League. Bundesliga. 2014-05-03 [2014-05-31]. （原始內容存檔於2014-05-31）. ^ （德文） Perisic und de Bruyne sind zuviel für Gladbach. kicker. 2014-05-10 [2014-06-01]. ^ （英文） Youthful Germany frustrated by Poland. UEFA. 2014-05-13 [2014-05-31]. ^ （英文） Lineups. UEFA. 2014-05-13 [2014-05-31]. ^ （英文） Eric-Maxim Choupo-Moting earns Cameroon draw against Germany. The Guardian. 2014-06-01 [2014-06-04]. ^ （英文） Low finalises Germany squad. FIFA. 2014-06-02 [2014-06-04]. （原始內容存檔於2014-06-03）.